Hi everyone I hope your Tuesday went well! 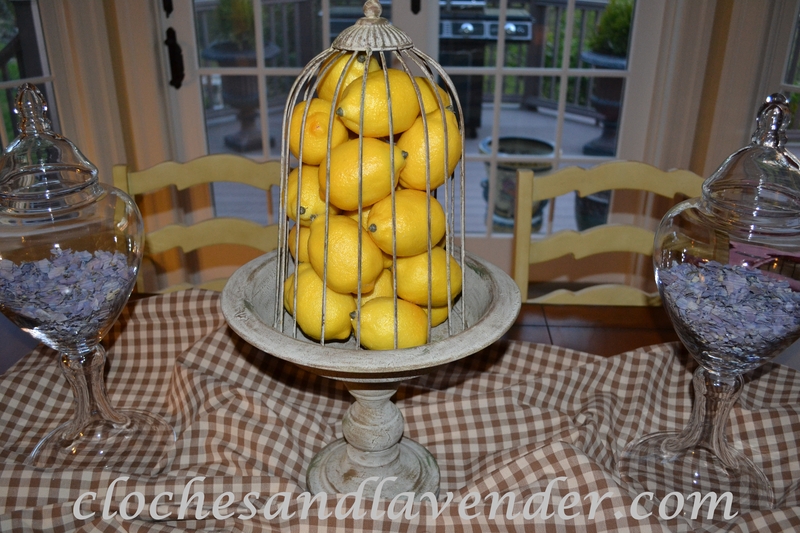 As many of you may remember, I recently wrote a post about my birdcage cloche and my kitchen table. Well, I had a problem finding a plant that would fit in the cloche; they were either non-flowering or were too tall because the cloche narrows at the top. 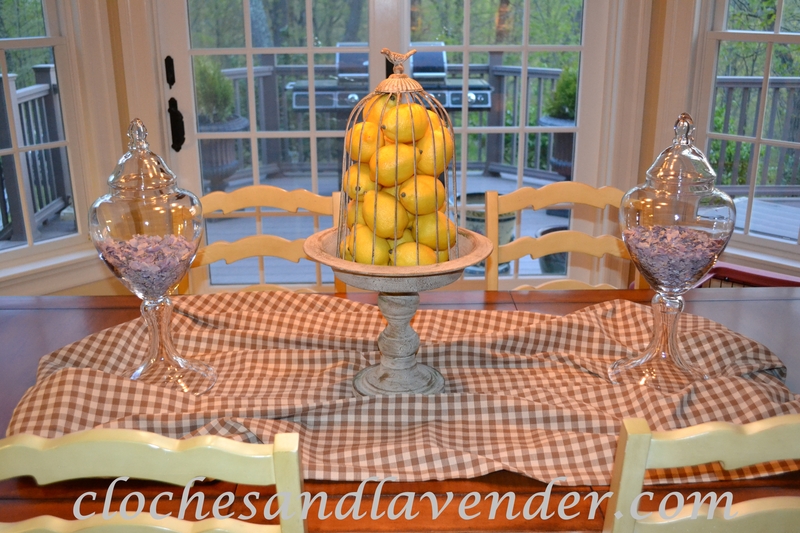 I decided to use lemons inside the cloche to add some spring and summer feeling to my table. 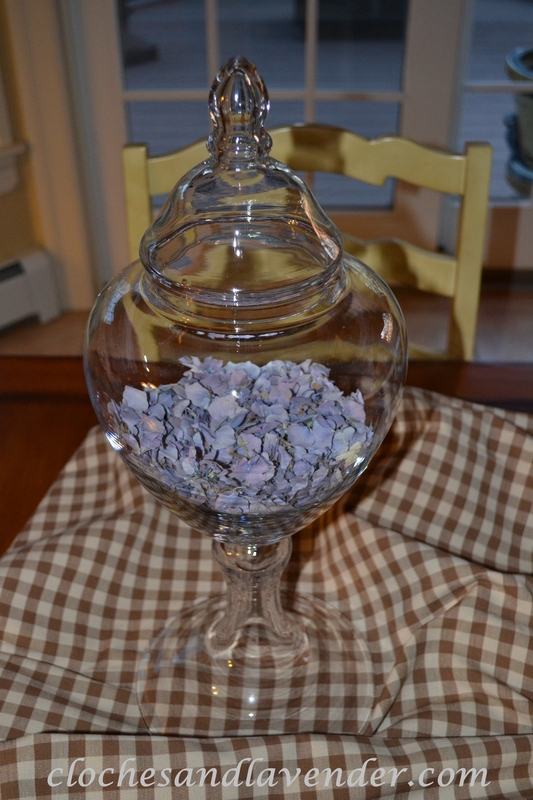 I also bought hydrangea petals and put them inside my apothecary jars for a little pick me up. I was happy with the way this turned out with the lemons and the petals, but I wanted to give the table some more depth, so I figured I would try some fabric in a casual way across the table. It adds some texture, color (since I have many fabric remnants around, I can easily change this out for the summer and it’s cheaper than tablecloths or runners) and is less formal than a table-cloth or runner and I can more or less scrunch it to suit my taste. For the early Spring, I decided to use this plaid fabric I had around and it is a nice compliment to the overall look. This looks very bright and colorful for the spring and summer. I like it very much. Love the lemons! They give great color. The petals are a lovely color too! I love the petals in the jar. And the lemon “cage.” Such a nice yellow pop! I think the lemons look very festive and compliment the hydrangea petals nicely. 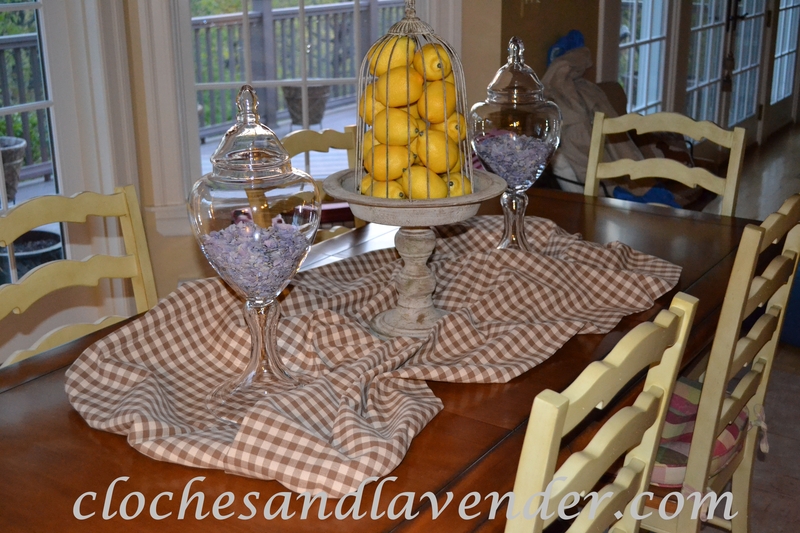 Love your idea about draping some fabric for a table runner. When we bought our kitchen table many years ago I wasn’t thinking about tablecloths then and it is oval and most all of the pretty tablecloths I see are oblong or square – silly me. I am glad you liked it, I am going to change it out for summer too. Thanks for checking in I like hearing from you. Very pretty! I love the purple petals with the bright lemons. Very nice combo!